Drop down lists make data entry easier, but they have limitations, such as small fonts, and only showing a few items at a time. Overcome those limits with the Data Entry Popup List kit -- it creates a popup list that makes it even easier to enter your data. See how it works, in the video below. When you click on a cell that contains a drop down list, the popup list will appear. 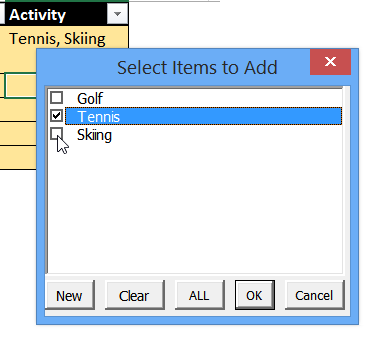 Quickly scroll through the list, then select a single item, or multiple items -- you'll make that rule when customizing the list. To see how the popup lists works, watch this short video. 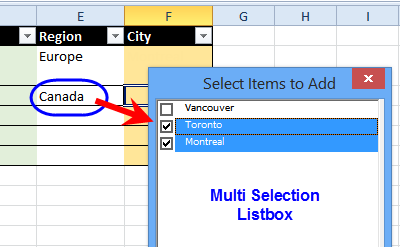 Most dependent lists work too -- Canada was selected in column E, and the City list for Canada is shown in the popup list. In the screen shot below, the multi-select list is showing. 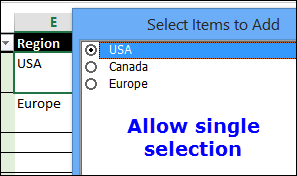 You can show a single select list, if you prefer, in any column. Follow the simple steps to copy the forms and code to your file. NOTE: The kit is designed for workbooks that do not have any existing Selection event macros on the worksheet. If you plan to integrate this code with existing code on the data entry sheet, you will need some programming skills, or assistance from a programmer. "This product is great, easy to use and customize to fit your needs. The autocomplete feature makes it easy for our employees to find what they are looking for in long lists. This is a clean simple solution to a problem we were having. By adding a few macros we were able to make a form with drop downs reset after each use. Click the Add to Cart button, to get the Data Entry Popup List guide and Excel files. Step by step purchase instructions are listed below. Within 30 minutes, you will also receive an email with a link to the download page. Your download will be available for 120 hours, or 5 downloads, whichever comes first. NOTE: I'm in Canada, near Toronto, with business hours in the Eastern Time zone. The Data Entry Popup (DVMSP) Kit licence is for a single (1) user. You may use the downloaded material for unlimited personal or business use, and you can share any workbooks that you create, in which you have inserted the DVMSP code and userforms. However, the setup, practice and demo workbooks in the DVMSP kit, and their contents, cannot be shared with others, except in your completed workbooks. After you purchase the Data Entry Popup Kit, you may return it for any reason, within 30 days. Your purchase amount will be fully refunded.